Rice Krispies Treats are a classic childhood dessert. It was a special night in our house when mom pulled out the ingredients to make a batch, and you can bet they were gone by the next day. I wanted to jazz up the classic recipe so I went on a recipe search. Up came this recipe that included peanut butter in the krispies mix, with a dunk in melted chocolate to finish it off. They are deliciously addictive. 1. Melt the butter over low heat in a large pot. Stir in the marshmallows and cook until fully melted and no marshmallow white remains. Stir in the peanut butter until combined. Stir in the cereal until distributed evenly through the marshmallow mixture. Pour out onto a lightly greased rectangular baking dish (9" x 13"). Smooth out the top of the treats by moistening your hands with a little water and using the palms of your hand to press down gently. Don't press down too hard or else your treats will be too dense. Set aside to cool. Wow. Those look really good. Really. good. Looks yummy. 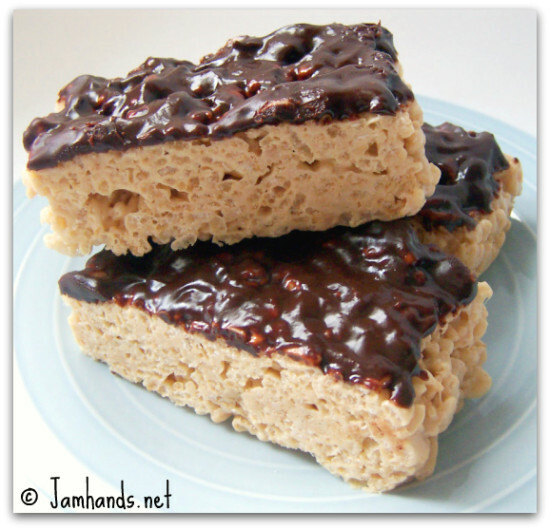 Rice Krispie treats are popular around here but I have never tried them with peanut butter. I figured it out. You are trying to kill me with your luscious food. I have made these hundreds of times and they are always a humongous hit! Glad you posted the recipe with such a great pic. Mix chocolate chips and butterscotch chips together, pour on top and you have got yourself a real treat!